Middlesex University Product Design student Harry Bradshaw has designed an app that allows people to safely share and debate issues that are important to them. The unique communications platform, called SoapBox, also transforms the way in which conversation takes place. Unlike Facebook and Twitter (where 'trolling' and online bullying are big problems) SoapBox focuses on the topics being discussed, not the people having the discussion. Harry started exploring what peer pressure is, and why it happens. This led him to look more generally at how some people try to influence others - for example, at Speakers' Corner, or on talk radio. Harry felt that in many ways, talk radio was a more controlled version of Speakers' Corner, with the debate being moderated and directed by the DJs involved. He explained how all this led to the development of SoapBox: "I think it's a real shame that in a world filled with technology and gadgets, we're losing the ability to converse proficiently. "I wanted to harness technology in a way that actually encouraged conversation and debate. I call it 'talk radio for the texting generation' - a mix of the behaviours involved in both texting and debating." Harry, 22, has studied conversation dynamics, and has identified unique conversational 'formulae' that encourage and facilitate constructive debate. This makes SoapBox the ideal social platform on which to discuss current affairs and trends. Harry hopes it will appeal to news channels, political discussion programmes, any shows which want to get people talking, and even MPs who want to connect with their constituents. 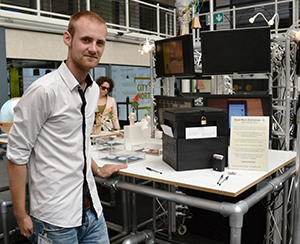 Harry created SoapBox as his final year project and recently graduated with a first-class honours degree.